Phonics taught through music, pictures and spellings for reading success. Includes 6 copies each of Book 1 and Book 2 (12 books in all), plus 1 music CD with all of the songs. Works well in a classroom to make it possible for each child to have a book while listening and learning the musical chants. 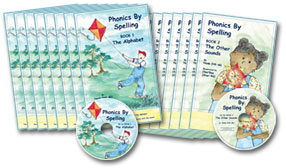 Copyright © 2013-2019 Phonics By Spelling. All rights reserved.